The Dionaea muscipula, or Venus Fly Trap as it is known, is a carnivorous plant. To be classified as carnivorous, a plant must attract, capture and kill its prey. It must also be able to digest its captured insects or any other animal life. The Venus Fly Trap is truly a plant, not an animal. The plant mainly grows in a small area along the coasts of two states, North Carolina and South Carolina. It lives in the wetlands and bogs where then weather is humid, wet and sunny. They eat spiders, flies, caterpillars and slugs. 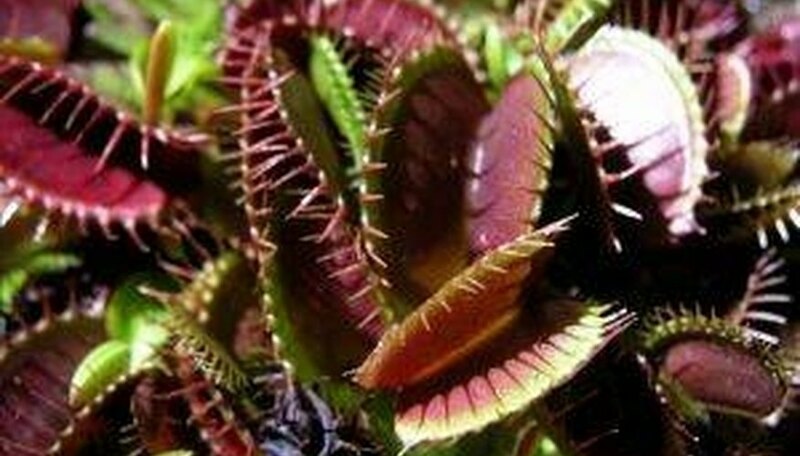 There are more than 500 varieties of carnivorous plants, so although the Venus Fly Trap is rare, it is not one of a kind. What is a Venus Fly Trap? Plants use a process called photosynthesis to convert carbon dioxide and water to sugar and oxygen The sugar is then converted into energy for the plant. Fly Traps are no exception to this process, but there are many other nutrients needed for plant growth, such as nitrogen, phosphorus and magnesium. They also need sulfur, calcium and potassium to sustain them and feed them as they grow. These nutrients are normally found in the soil where the plants are located. Fly Traps are found in a highly acidic soil that doesn't have many nutrients. Most plants cannot survive where you will find a Fly Trap growing because they cannot make enough energy to grow. The Fly Trap has adapted to the terrain by using insects and other animal life to provide it with nitrogen and carbohydrates for energy. The Fly Trap possesses a set of leaves that are both their mouth and stomach. It does not know when it's hungry nor does it have any muscle or nerves that can crush and chew the food. It is all a mechanical and chemical process that is actually simple. Inside the leaves, a sweet nectar secretes and attracts the flies and spiders. The bugs think that nectar is food and willingly come into the leaves. The plant contains a set of six trigger hairs on each trap. They are short and stiff. If two of them are disturbed by the insect or one of them is touched twice, the trap snaps shut. It only takes about half a second to trap its prey. If a leaf or some other inedible object falls on the traps leaf, it may come in contact with one of the trigger hairs but most likely will not be moving around to contact another. The trap may partially close and stay that way for around 12 hours before completely opening again. If the trap is partially closed and a fly lands on it, the movement of the fly will cause the trap to close completely. Once the trap closes, the finger-like cilia at the edges of the leaves intertwine and seal the trap airtight. This keeps out bacteria and mold while the trap is digesting its prey. It also keeps digestive juices inside the trap. The acidic juices not only eat away at the flesh of their food, but they also have a little antiseptic in them to kill any bacteria that may have gotten in. The digestive juices are continually secreted into the insect for a total of up to 12 days while the plant takes in the nutrition. The actual time depends on the size of the prey. When there is nothing left but the exoskeleton of the insect, the trap will open and the remains will either be washed out by rain or blown away by the wind. Fly Traps can be grown at home but the habitat must be as close to the plant's natural habitat as possible. Why Do Carnivorous Plants Grow Well in Nitrogen Poor Soil?